Monroe County Hospital: Surgical Department. The surgery department here at Monroe County Hospital has one procedure room set up for endoscopy procedures and one surgery suite. It is staffed with one surgical RN, one surgical scrub tech and one Post Anesthesia Care Unit RN. The anesthesia is provided by a Certified Registered Nurse Anesthisist (CRNA). 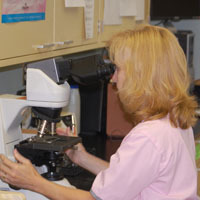 We have two General Surgeons from Macon Medical that provide surgical and endoscopy services. The clinic address is 120 N. Lee St. Forsyth. We also have two Podiatrists on staff. Dr. Henson and Dr. Roberts come to Forsyth from Griffin. Clinic days are Monday mornings and Friday mornings here on campus. Call their office number for an appointment. The surgical experience at Monroe County Hospital includes a pre-operative appointment. During the pre-operative appointment, you will be given information regarding the day before surgery, the day of surgery, and what to expect after surgery. Our goal is to inform you on every step of the process and answer any question you may have so you can have a satisfying experience during your surgical stay. Please click on the above links for more information.